From left are Dakota Zurface, Paige Bowman, Grace Cooper and AJ Roerich. 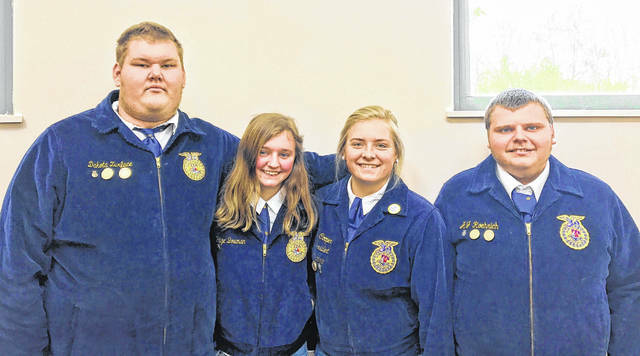 The East Clinton FFA Dairy Foods Team on Oct. 2 traveled to the World Dairy Expo, where they competed in the National Central Dairy Foods Contest. The team of Paige Bowman, AJ Roerich and Dakota Zurface competed very strongly, and their hard work brought them third overall in the nation as AJ placed third individual, Paige placed ninth individual, and Dakota placed 36th overall. The team will receive recognition for being in the top five teams, and Paige and AJ will receive recognition for being in the top 10 individuals. Thank you to the school and our chaperones for making this trip happen.